While Arizona Coyotes oft-injured defenseman Jakob Chychrun will be playing in his 30th game Sunday, the defenseman still isn’t 100 percent after offseason surgery on his right ACL. The 20-year-old is already in his third season in the NHL, but he hasn’t played more than 68 games in a season due to injuries. The most recent injury, he knows he’ll just have to play through, according to The Athletic’s Craig Morgan (subscription required). Regardless, Chychrun has been making the most of his time as the defenseman has three goals and 10 points while averaging 20:12 in ATOI this season with 41 hits and 41 blocked shots. Arizona head coach Rick Tocchet has been impressed with Chychrun’s play despite his struggles with injury. Saturday’s matchup between the San Jose Sharks and Tampa Bay Lightning was played without star defenseman Erik Karlsson, who chose to sit out with a lower-body injury. Reports suggest that Karlsson might sit out the team’s final two games on Monday and Tuesday, to rest up until after the All-Star break. However, while that loss is significant to the team, fellow defenseman Marc-Edouard Vlasic missed his eighth game and The Athletic’s Kevin Kurz (subscription required) writes that the team may not be missing Vlasic much at all. The team has outscored their opponents 24-15 with Vlasic out. That along with his minus-13 rating might suggest that the team might be better off using a more offensive-minded defenseman in his stead like Tim Heed. The Vegas Golden Knights have always followed a general philosophy when it comes to pairing up their defensemen. Head coach Gerard Gallant loves to pair a fast, quick-moving offensive defenseman with a bigger defensive counterpart. However, with Nate Schmidt missing the first 20 games of the season with a suspension, Gallant hasn’t had the opportunity to put together his perfect pairing, which included Schmidt matched up with Brayden McNabb, Shea Theodore with Deryk Engelland and Colin Miller paired with Nick Holden. The Athletic’s Jesse Granger (subscription required) analyzes those new changes which has produced a 3-0 record since Gallant put those pairings together, including a 2-1 overtime win over Arizona and a pair of shutouts over Calgary and San Jose, Friday and Saturday. That’s just one goal allowed in 183 minutes. While it has been made clear that the team missed Schmidt, Vegas’ entire defense missed him as everyone had been shuffled out of alignment without the speedy blueliner. Without Schmidt, the team lacked a third offensive defenseman as the team had to pair Holden with Jonathon Merrill, which struggled throughout the first quarter of the season. Rick Dhailwal of Sportsnet reports that he’s heard from a source that Vancouver Canucks winger Brock Boeser is making good progress recovering from his groin injury. The 21-year-old has been out since Nov. 2. The scribe adds that Boeser is getting closer and should be back at some point next week. He has four goals and 11 points in 13 games so far this year. One of the Los Angeles Kings struggles comes from the play of major off-season acquisition Ilya Kovalchuk who has failed to record a point in eight straight games, according to Curtis Zupke of the Los Angeles Times. The 35-year-old, who signed a three-year, $18.75MM contract this summer, has gone from the team’s top winger to a third-stringer and has dropped to the second unit of the power play. The team broke their 0-for-16 slump on the power play Saturday with Kovalchuk on the bench. Fox Sports Jon Rosen writes that the Kings need to get more playing time to rookie Matt Luff, who has played well since being called up from the AHL. The 21-year-old has three goals in eight games after dominating in Ontario. Head coach Willie Desjardins re-teamed him with Carl Hagelin and Adrian Kempe, which found some success for the Kings. The scribe writes that Luff needs playing time and needs to start receiving power play time as well. Rosen also adds that the Kings have no interest in bringing former Edmonton Oilers’ coach Todd McLellan aboard. The Los Angeles Kings could use some good news with their goaltending issues and they got some Sunday as NHL.com’s Kevin Weekes reports that Jonathan Quick skated today in full gear, which is the next step in his recovery after undergoing surgery on Oct. 31 to repair a torn meniscus in his right knee. Weekes reports that Quick just worked on his crease work, but did not go down and did not take any pucks. Regardless, that has to be good news for L.A. who are without both Quick and his backup, Jack Campbell, who went down with the exact same injury. Instead, the team is going with the AHL tandem of Peter Budaj and Calvin Petersen. However, the team would much prefer to see Quick return to the lineup as new head coach Willie Desjardins continues to try to turn around the Kings after a poor start. Fox Sports’ Jon Rosen adds that Quick could take on a heavier load in practice on either Wednesday or Friday. Cat Silverman of The Athletic reports that the Arizona Coyotes had two injured players return to practice Sunday as goaltender Antti Raanta and defenseman Jakob Chychrun both practiced. Raanta’s practice was a short one, but he did participate in full drills while he was there. He was placed on injured reserve on Nov. 7 with an undisclosed injury. Chychrun recently returned to the team after recovering from offseason surgery and then immediately was placed on injured reserve after one game with an upper-body injury. He was a full participant in practice today and with full contact. Both are considered likely to play Wednesday against Vegas. Edmonton Journal’s Jim Matheson writes that it’s unlikely the Edmonton Oilers will get involved in the William Nylander sweepstakes with the Toronto Maple Leafs as the team would likely have to send back defenseman Adam Larsson, which the Oilers would not be willing to do. Instead Matheson believes the Oilers’ best course of action would be to wait for the trade deadline and make a play for the New York Rangers Mats Zuccarello, who will be a unrestricted free agent next year, but could be a good fit in Edmonton. The return of Nate Schmidt to the Vegas Golden Knights Sunday is good news for defenseman Colin Miller, who has been forced to take over Schmidt’s role as a No. 1 defenseman, always in charge of facing opposing team’s top line. That has been a challenge for Miller, who is better off as a second-pair defenseman, according to SinBin’s Steve Carp. That role has altered the way Miller thinks as he has had to focus on defense first and put offense on the back burner. Miller, who had 10 goals and 41 points last season, currently has no goals and six assists in 20 games. However, with Schmidt taking his previous role starting tonight and expected to be paired with Shea Theodore, Miller can return to his old role, which could result in an offensive boost for Vegas. Joe Pavelski has seen a number of teammates play through their expiring contracts and not let it affect them. Joe Thornton has done it twice in the last two seasons, while Patrick Marleau did it recently as well, although he opted to find a new home. Now the San Jose Sharks’ center is in the exact same situation, explains Kevin Kurz of The Athletic (subscription required). The 34-year-old Pavelski is in the final year of a five-year, $30MM contract and so far, there have been no talks of an extension with the long-time Sharks’ veteran. Just like Thornton and Marleau at the time, the lack of a deal isn’t affecting Pavelski’s play as he’s put up 11 goals so far this season, which is already half way to the 22 goals he scored last year. Good news for the Anaheim Ducks as the team learned today that barring a setback, forward Ondrej Kase is expected to make his debut on Monday, according to Eric Stephens of The Athletic. Kase has been reportedly skating on a line with teammates Ryan Kesler and Nick Ritchie. Many people felt that Kase might take his game to a new level this year after posting a 20-goal season a year ago. The 23-year-old, however, suffered a concussion during the team’s final preseason game and has been out since then. The former seventh-round pick has done a nice job working his way through the Ducks’ system and earning a full-time role with the team. He was rewarded over the summer with a three-year, $7.8MM ($2.6MM AAV) bridge deal. Hopefully, he can step in right away and help out a struggling team that has gone 2-7-2 in their last 11 games. The Vegas Golden Knights should get a boost in one week when suspended defenseman Nate Schmidt becomes eligible to return. The speedy defenseman has been missed by his team as they struggle through the early part of the schedule. SinBin Vegas’ Steve Carp writes that Schmidt should immediately return to the role as the team’s leader in minutes played and shutdown defender as well inject both special teams’ units with his talents. However, the team doesn’t have the luxury of easing him in as other teams might considering the team’s inability to string together wins. Despite scoring his first NHL goal of his career, Dallas Stars prospect Denis Gurianov was returned back to the AHL Sunday and while the 21-year-old impressed, The Athletic’s Sean Shapiro reports that the team made the move for cap reasons. Regardless, the team believes that while Gurianov has come a long way since last season when he was scratched during multiple games in the AHL playoffs, he still hasn’t done enough to force his way into a permanent role with Dallas. The London Knights have announced their new leadership group for the 2018-19 season now that several key players have returned, and Edmonton Oilers defenseman Evan Bouchard has been given the captaincy once again. Bouchard played seven games for the Oilers before being sent back to junior for the rest of the year, and should immediately step into his role playing nearly 30 minutes a night for London. One of the most effective players in the OHL, Bouchard will also likely be a key member of the Canadian World Junior squad in the coming months. Joining him with letters for the Knights are several other well known prospects, including Alex Formenton of the Ottawa Senators and Liam Foudy of the Columbus Blue Jackets. Formenton played nine games for the Senators this season and scored his first NHL goal, while Foudy was the 18th-overall pick in June after dominating the NHL Draft Combine. William Lochead and Cole Tymkin, both undrafted, will round out the group of alternates for the Knights this season. Antti Raanta will be out at least a few days with a lower-body injury for the Arizona Coyotes, meaning they were forced to recall Hunter Miska under emergency conditions. Craig Morgan of The Athletic adds that Raanta has subsequently been placed on IR and will be out until November 13th at the earliest. Miska will serve as the backup to Darcy Kuemper for tomorrow’s game in Philadelphia, but perhaps he will be forced into action before too long given the team has a back-to-back against Pittsburgh and Washington that are scheduled fewer than 24 hours apart. Though the Vegas Golden Knights will be without Erik Haula for at least a few games—and perhaps many more given the optics of last night’s injury—they welcomed back another familiar face to practice today. Nate Schmidt was back on the ice with the team, and can now take full part of practice as he waits out the last ten days of his PED suspension. November 18th is the first game action Schmidt is eligible for, when the Golden Knights head to Edmonton to take on Connor McDavid and the Oilers. Even though the Toronto Maple Leafs have their hands full with the contract negotiations with William Nylander and the future negotiations with Auston Matthews and Mitch Marner, The Athletic’s Pierre LeBrun (subscription required) writes that the team also will likely have issues with defenseman Jake Gardiner. The scribe writes that while Gardiner has expressed his desire to remain with Toronto long-term and general manager Kyle Dubas has met up with Gardiners’ representative, Pat Brisson, it’s likely that Gardiner will have to wait until the contracts of Nylander, Matthews and Marner are finalized, which could edge him out if those players don’t take hometown discounts. Regardless, after Nate Schmidt signed for $5.95MM AAV a few days ago, Gardiner could get quite a bit more on the open market especially with so few quality blueliners available on the free agent market next season. He might be able to command $7MM per year. However, he will likely have to take less than $6MM if he wants to remain in Toronto. In a mailbag series, NBC Sports Joe Haggerty questions whether Boston Bruins goaltender Tuukka Rask is really a No. 1 goalie, pointing out that he struggles when he is used regularly, which forced the Bruins to sign Jaroslav Halak to a $2.75MM contract. A true No. 1 goaltender wouldn’t require a team to pay that much for a backup and play 30 games for him. Add to that that Rask is known to be a slow starter and really struggles when the defense in front of him isn’t at their best, Haggerty doesn’t believe that the team currently can look at him as a top-rated goalie. Schmidt, 27, is still dealing with a 20-game suspension for a positive banned substance test in the offseason, and will not be eligible to return to game action for the Golden Knights until November 18th against the Edmonton Oilers. Though the defenseman vehemently denies taking any sort of performance enhancing drug, he’s serving his suspension and had been practicing in Austria with a professional team. Staying game-ready is important at this point, as the Golden Knights will likely put a ton on Schmidt’s plate as soon as he’s eligible to return. After being picked from the Washington Capitals in the expansion draft, Schmidt immediately saw a huge increase in responsibility and turned in a career-best performance in 2017-18. Logging more than 22 minutes a night in the regular season, the smooth-skating defenseman recorded 36 points in 76 games and then was pushed even further in the playoffs to help Vegas climb all the way to the Stanley Cup Finals. One of the most important players on the team, his absence has been felt in the early going of this season. The Golden Knights are off to a shaky start in 2018-19, posting a 4-4-1 record through their first nine games including a loss last night to the Vancouver Canucks in overtime. For the team that shocked the hockey world on a nightly basis a year ago, things haven’t gone quite as smoothly in their sophomore effort. Getting Schmidt back will certainly help that, and locking him up going forward allows them to build around him in the coming years. Those years though don’t come without substantial risk. While Schmidt has been good for the team so far, he still does have just 276 NHL games under his belt and will turn 28 before the extension kicks in. An undrafted free agent from the University of Minnesota, he’ll need to provide even more offense for the Golden Knights to really warrant a deal of this magnitude. Schmidt would have been highly sought after on the unrestricted market, but the direct comparables to this deal don’t paint a very pretty picture. Jeff Petry, Andrew MacDonald, Marc Staal, Jonathan Ericsson and Andrej Sekera are the five closest contracts according to CapFriendly, a group that inspires very little confidence at this point. Still, the Golden Knights believe they have a player who can be a key contributor for them as they attempt to get back to the Stanley Cup right away. The attempt to compete right away was likely caused by the unprecedented success Vegas experienced last season as an expansion team, but also could be misguided at this point in team history. While last season was an outstanding performance from all involved, signing contracts like this has quickly taken away any long-term advantage the Golden Knights had with their empty balance sheet. The team at one point had oodles of cap space available to use as leverage in trade talks, taking on bad contracts in order to beef up their prospect cupboards, but have used up almost all of it on their key contributors from last season and a few new faces. Jon Marchessault, Alex Tuch, Max Pacioretty, Paul Stastny, Shea Theodore, Colin Miller, Brayden McNabb, Marc-Andre Fleury and now Schmidt have all signed contracts or extensions of at least three years in length, and now make up the do-or-die core of the team. That group of nine players will be owed nearly $48MM next season and beyond, while the team also has a long-term commitment still with Reilly Smith and will likely sign one with William Karlsson before long. There’s obviously nothing wrong with building around a group like that, but the Golden Knights no longer have that unprecedented advantage of having an empty salary structure. Still, that’s obviously a decision they’re willing to make to sign players like Schmidt long-term. The team has built a strong fan base in Vegas and around the league, and have ensured that they’ll be at least competitive with this group for years to come. Whether it’s good enough to really contend for the Stanley Cup down the line is yet to be seen, but it’ll at least be a fun ride while we find out. Pierre LeBrun of The Athletic reported the contract breakdown. 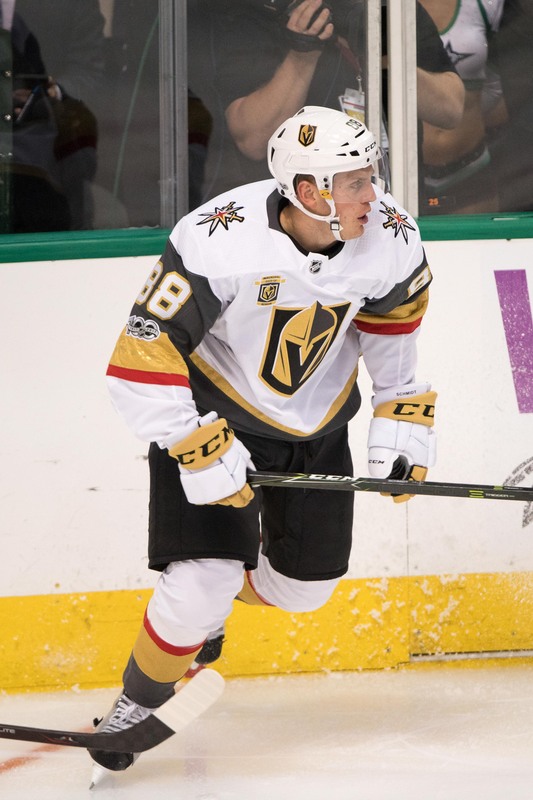 Vegas Golden Knights defenseman Nate Schmidt is still weeks away from making his season debut, but he’s taking his first step toward returning to normality. Schmidt, who was suspended 20 games for testing positive for a banned substance in violation of the NHL’s PED policy, opted to spend the early season in Europe. Schmidt has been practicing with the Vienna Capitals of Austria’s EBEL this month, but is now wrapping up his time with the team. Sports Illustrated’s Alex Prewitt reports that Schmidt plans to return to North America in the next week as the month of October comes to an end. With close to a month still remaining before his 20 games are up and he can return to game action with Vegas, Schmidt will not go right back to his current squad. Instead, Prewitt adds that he will join his former team at the University of Minnesota as a practice participant for a short period of time. However, Prewitt notes that the CBA allows Schmidt to join the Golden Knights in a limited capacity beginning on November 8th. At that time, he can join in team meetings and practices. November 18th, a road game against the Edmonton Oilers, will mark Schmidt’s official return to the team. While the defense has held up in Schmidt’s absence, the defending Western Conference champs are only a .500 team through eight games and the third-worst offense in the league. Schmidt, who was second among defensemen and ninth overall in points for Vegas last year, will be a welcome addition to a team that needs a spark early this season. Kris Versteeg’s season overseas was short-lived. The veteran winger was unable to find NHL employment this off-season and ended up signing with the KHL’s Avangard Omsk in early September. However, NHL.com’s European insider Igor Eronko reports that Versteeg is leaving the team to return to North America. Eronko did not have any more information on the reasoning behind Versteeg’s early exit, but this isn’t the first time that the 32-year-old forward has backed out of an opportunity abroad. Versteeg signed in Switzerland back in the summer of 2016, only to terminate his contract before ever playing with the club, the NLA’s SC Bern, allegedly due to medical insurance issues. He soon after committed to a PTO with the Edmonton Oilers that turned into a contract with the Calgary Flames. Perhaps Versteeg again senses an opportunity back in the NHL and has found a way out of his KHL obligations. For his part, TSN’s Darren Dreger states that Versteeg has been sick with shingles and proffers this could be the primary reason for the departure. One way or another, Versteeg’s time with Avangard is over after just 11 games and we will soon know about about his immediate plans. One player not returning to the NHL, despite some speculation, is forward Wojtek Wolski. Wolski recently terminated his contract with KHL club Mettalurg Magnitogorsk and was seeking a new place to play. That appears to be limited to either remaining in the KHL or moving to the NLA in Switzerland, rather than a return to North America, per a report from a Swiss news source. A return to the NHL for the 32-year-old Wolski, now six years separated from his last action at the highest level, was always a stretch, but many fans would not have minded seeing the Polish-Canadian star try his hand at a comeback.